Voice your opinion! Review DrayTEL now. This company knows their stuff. They are very smart and competent. Better service than Iâ€™d hoped for! 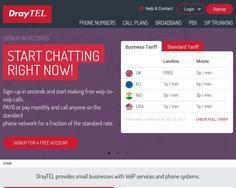 DrayTEL is an Internet Telephone service using Voice-over-IP (VoIP). Setup a free DrayTEL account and PAYG or pay monthly.